Individuality is often viewed as an exclusively Western value. In non-Western societies, collective identities seem to eclipse those of individuals. These generalities, however, have overlooked the importance of personal uniqueness, volition, and achievement in these cultures. 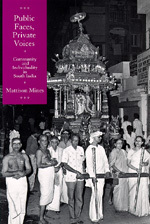 As an anthropologist in Tamil Nadu, South India, Mattison Mines found private and public expressions of self in all sectors of society. Based on his twenty-five years of field research, Public Faces, Private Voices weaves together personal life stories, historical description, and theoretical analysis to define individuality in South Asia and to distinguish it from its Western counterpart. This engaging and controversial book will be of great interest to scholars and students working in anthropology, psychology, sociology, South Asian history, urban studies, and political science. Mattison Mines is Professor of Anthropology at the University of California, Santa Barbara. He is the author of the The Warrior Merchants: Textiles, Trade, and Territory in South India (1984).